» Scorsese’s Oscar: Mike Trout Finally Won the MVP, But Could He Already Be in Decline? In recent years, debates about baseball’s regular-season awards have turned mid-November into a contentious time. Squabbles about the relative virtues of Miguel Cabrera and Mike Trout, the top two finishers in the 2012 and 2013 AL MVP races, made those awards seasons a mix of (a) meaningful discussions about positional adjustments, park factors, and the merits and drawbacks of defensive statistics, and (b) semantic, Swiftian tiffs about the definition of “valuable” vis-à-vis “best.” After two years of firing the same broadsides and unleashing the same snark, even columnists with quotas to fill weren’t eager for Round 3. So it came as a relief that when Trout finally topped the competition, he did so without any dissent. On Thursday, the Angels outfielder became the first player to win the AL award unanimously since Ken Griffey Jr. in 1997, and the second ever to win it after two consecutive second-place finishes. The first? Mickey Mantle, of course, the player whom breathless writers (and projection systems) have been comparing Trout to since before he lost his rookie eligibility. We can find a few reasons why Trout won so easily this time after falling short in two previous deserving seasons. For the first time, Trout’s team qualified for the postseason, which some voters view as a prerequisite for (or a strong factor in favor of) any aspiring MVP. He had less intense competition: No one won the Triple Crown, as Cabrera did in 2012, and no player but Trout matched Cabrera’s WAR total from 2013. Trout also set career highs in home runs and RBIs (leading the league in the latter), categories that tend to catch the electorate’s attention. And there may have been some makeup votes mixed in: In the absence of a clearly superior candidate, conflicted voters may have given the tiebreaker to Trout in recognition of his earlier close calls. Notably absent from that list of popular explanations is the one that would seem the most likely: that Trout simply became better at baseball. According to both formulations of WAR, Trout’s 2014 season — the one in which the BBWAA belatedly deemed him the AL’s most valuable player — was actually his least valuable yet. It’s difficult to talk about Trout’s 2014 without invoking his rookie campaign. In 2012, by Baseball-Reference’s reckoning, Trout finished first in batting runs, first in baserunning runs, and fifth in fielding runs. The second-best batter, Cabrera, was below average on the bases and in the field. The second-best baserunner, Michael Bourn, was a fine fielder but only average at the plate. And the second-best fielder, Darwin Barney, was a decent baserunner but abominable at bat. Trout was amazing at everything, and he was also a rookie who spent most of April in the minors and didn’t turn 21 until August. Few players have seasons in which they compile 10 wins’ worth of value: Trout’s rookie year was a full win better than any year Albert Pujols, a surefire Hall of Famer, ever had. It’s almost unheard of, however, for talent to be bestowed so lavishly on a single player in every aspect of his game. Ted Williams had a few seasons in the same value stratosphere as Trout’s; late-career Barry Bonds was even better. But both of them were all bat, adding little with legs or leather. Trout added runs or saved them wherever he was on the field. 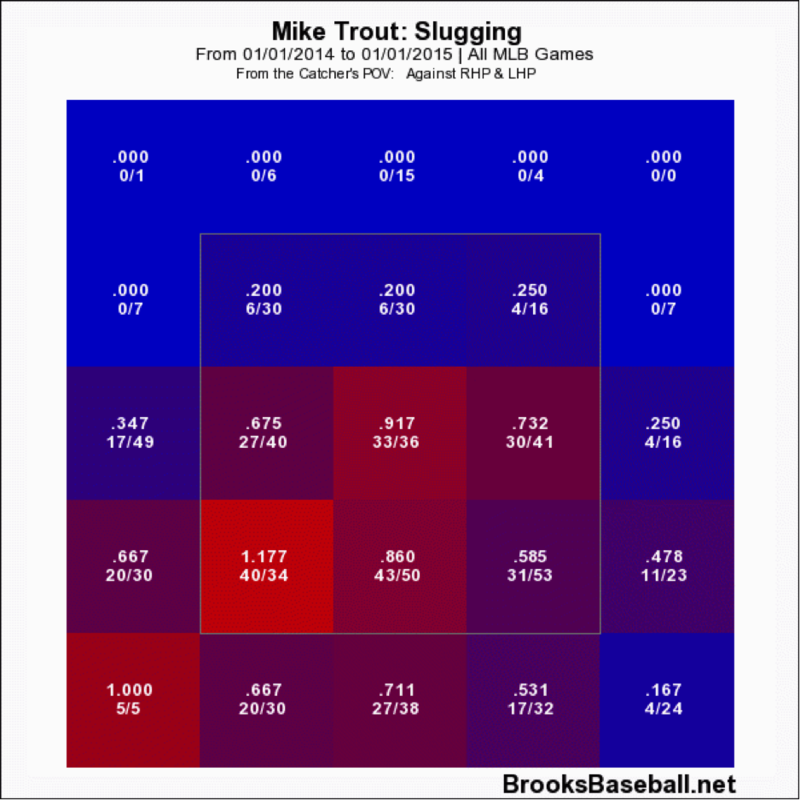 Trout’s bat was even better in 2013, and he was worth even more because he played a full season — but his secondary skills seemed to subtly slip. In 2014, that slip gave way to a stumble that was harder to ignore. Trout’s steals and overall value on the basepaths went way down. His defensive stats declined considerably: Both DRS and UZR, which had rated him one of the best center fielders in 2012, agreed that he was one of the worst. As Joe Posnanski noted in August, the MVP case for Trout this time around was closer to Cabrera’s case from 2013 than it was to Trout’s from 2013. It wasn’t the same case, of course: Trout is still a center fielder, and still a net positive on the bases, which ruled out any serious challenge from slow, 1B/DH sluggers like eventual runner-up Victor Martinez or fourth-place finisher Jose Abreu. However, the pro-Trout argument had narrowed and lost nuance: Now, it boiled down to his being the most valuable batter in the league.1 The progressive sites that had championed Trout’s AL MVP candidacy in 2012 and 2013 still hoisted him on their shoulders at the end of the year, but only after casting lingering glances at all-around standouts such as Alex Gordon and Michael Brantley. For that reason, Trout winning the MVP for his 2014 felt like Scorsese winning Best Director for The Departed. Sure, he was wonderful, and probably better than the competition, but he wasn’t at his personal peak. Trout’s award seemed to rectify a wrong, but it made the initial oversight more glaring. It’s great that they gave it to him, some grumbled after last evening’s announcement, but why did they snub him before? One could easily call this nitpicking. Is it really worth dwelling on whether the best player in baseball is a little less great, slightly less separated from the closest competition? The intention isn’t to tear Trout down. In fact, it’s the opposite: Because Trout is so special, we’ve always been compelled to keep pinching his performance to make sure it’s real. We all want to believe that we’re living in momentous times and witnessing unprecedented events, but mostly we’re deceiving ourselves, fooled by our limited memories and senses of self-importance. Trout, though, made it true: No baseball player has ever been better through age 22.2 And when a player is off to the best start of anyone, ever, any change in trajectory is almost guaranteed to be bad. No one would suggest that Trout is about to enter his Gigli/Jack and Jill phase. Still, there’s that diminished defense, those measly 16 steals. There’s the slight slowing of his foot speed that could have contributed to both: According to one team’s internal metrics, Trout’s median home-to-first time increased by a little less than 0.1 seconds from 2012 to 2013, then increased by a little less than that from last season to this one.3 And while 2014-era Trout produced as much offensive value per plate appearance as he had in 2012, he did it in different ways. 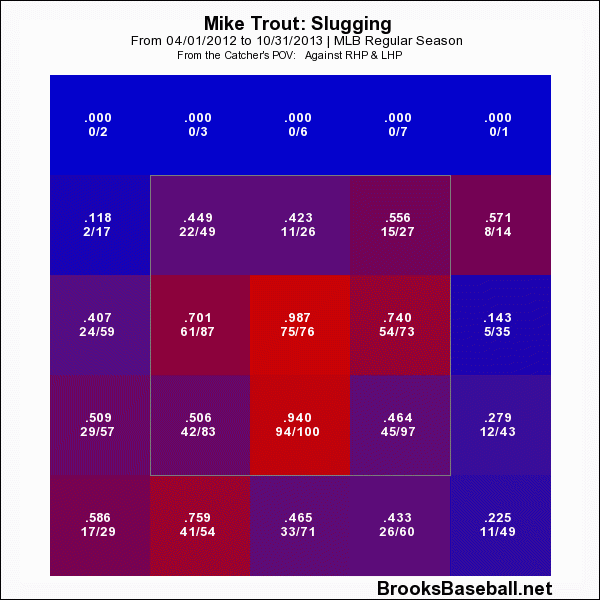 Trout’s power output increased, but his batting average sank and his strikeout rate rose. There are ways to explain all of these developments without concluding that Trout’s true talent has declined. Defensive statistics fluctuate from season to season; often, even fielding metrics based on the same underlying data disagree. Maybe Trout’s glove wasn’t as good as the stats suggested in 2012,4 and maybe it’s not as bad as they indicate now. The slower run times and decreased steals? Maybe his sore hamstring hurt more than he admitted or, as he claims, pitchers have gotten more diligent about holding him on first. As for the strikeouts, maybe he’s just prioritizing power over contact, although he denied this when I asked him in April and hasn’t wavered since. No player since the mid-1970s has had a season that satisfied the same parameters. With help from Andrew Koo and Rob McQuown of Baseball Prospectus, I gathered all player seasons with a minimum of 500 plate appearances that followed a prior big league track record of at least 1,000 plate appearances (Trout had 1,490 PAs under his belt before 2014). The players who saw their ISOs increase by at least 15 percent were younger and less experienced than average, but the players who saw their SB rates fall and strikeout rates rise by degrees comparable to Trout’s were significantly older and more experienced than average, which suggests that it’s rare for a player’s performance to shift in those ways so soon. In the season following their extreme performance changes, most players’ stats regressed toward their career rates, but few bounced back all the way. The result, then, was that on the media conference call immediately after Trout’s emotional moment of triumph, some extremely rude writer spoiled the mood by asking the MVP whether he plans to make any adjustments if the high-heat pattern holds true in 2015. Trout, whose ability to avoid anything close to an interesting quote might be his most impressive skill, didn’t deny that he needs to evolve, though the adjustment he prescribed — which echoed Angels hitting coach Don Baylor’s proposed solution from August — is more mental and emotional than physical. With assistance from Dan Brooks of Brooks Baseball and Harry Pavlidis of BP, I looked for the largest percentage-point increases in high-fastball rate from the PITCHf/x era (for this purpose, 2008-14), defining “high” as the upper third of each player’s strike zone and above. Trout’s rate increase ranked fifth among players with at least 500 four-seamers faced. High-fastball percentages are fairly consistent, but the change in high-fastball rate from one year to the next is moderately inversely correlated with the change in high-fastball rate in the following year.6 That means that the more a hitter’s high-fastball rate rises in one season, the more it’s likely to fall in the next. Like anything else, high-fastball-rate changes regress toward the mean. This makes some sense. Hitters face different distributions of pitchers each year, some of whom are more or less likely to throw high. Plus, pitchers don’t have perfect command: Sometimes they aim high and miss low, or vice versa. Hitters who see more pitches in a certain location may adjust, forcing pitchers to go back to the drawing board. And while Trout crushed low pitches and struggled against high ones in 2014, his high/low-pitch slugging percentage disparity wasn’t as pronounced from 2012 to 2013. It takes time to develop the “book” on a batter, which is based on mechanics and swing planes as much as small-sample shifts in performance. In other words, it wouldn’t be shocking if Trout started seeing more low pitches again next season, or hit better against high ones. Forecasting declines in baseball is an inexact science based largely on examining the past performance of comparable players.7 In Trout’s case, we’re attempting to forecast the incomparable, an even more error-ridden exercise. As James wrote in a sequel to his young/old player’s skills study, “Those players who are most exceptional are also, of course, those players whose skills mature at an early age. The rules which govern exceptional players are not the same as those which govern ordinary players.” To this point, Trout has been nothing if not exceptional; with any luck, he won’t approach ordinary for many years yet. An easy call even without adjusting for position or contributions on the basepaths, thanks to Cabrera’s slide down the leaderboard. Only four players have been better through age 23 — and Trout hasn’t started his age-23 season. Jeff Sullivan timed Trout himself and arrived at similar results. That season, according to Baseball Info Solutions, Trout robbed four home runs; he hasn’t stolen one in center since. Because they require perfect fly ball placement, home run robberies depend on opportunities as well as skill. To some extent, this is a leaguewide trend, perhaps because as the strike zone has sunk and pitch locations have chased it, hitters, too, have set their sights low, leaving them unprepared for high pitches. Then again, that strike zone shift may have recently reversed course. A correlation of more than 0.4. Another problem: Aging curves may have changed over time. Checking In on Europe’s World Cup Heavyweights: What’s New in the Old World?